Most times, the only reality got by anxious people outside the periphery of an event is the picture constructed by journalists. The journalist is a powerful personality. There is no doubt about it, though many seek to abuse such power. The journalist creates perceptions and gives meanings to events . He sets the tone for public perceptions. He is viewed as a professional observer and interpreter of events and what he says shapes public opinion but when journalists cannot be independent and objective eye-witnesses, readers will always end up with the wrong perceptions about people, countries and events. This is the dilemma facing readers of newspapers and viewers of TVs in the Western world. They never get to know African leaders better or an accurate picture of African events because those who write or produce the stories about Africa do so with a negative and stereotypical mindset . They are trusted to always slant the news about Africa. According to the Western journalist , Africa is always a darkest continent full of HIV/aids, infectious diseases, chronic poverty , dictators , filth , ignorance and backward social and political systems. The best African leader is only a fitting candidate for the caricature of a dictator. There are often good reasons to blame the journalists themselves who do the dirty work for their prejudiced and jaundiced attitudes towards Africa . but the media systems they work for come in too for a share of the blame . The Western media thrives on nothing but negativity and stereotypical images when it comes to Africa. That is the only reality of Africa known to Westerners and that is what sells their newspapers and give their radios and TVs ratings. News about Africa must always have a negative and insolent bent . But professional journalism needs not go that road . News reports and interviews should be fact-based, straight blow-by-blow description of events and focused on nothing but the facts. If the journalist wants to give his opinions, he is free to do so in op/ed articles. Not being able to draw a line between a plain news reports and an opinion article is responsible for the charade that journalism has become, even in the West. In view of the fact that they have better training privileges and a supposedly more enlightened professional environment to operate from , you would want to think that journalists in the West understand and master this essential aspect of the inky trade, which is also taught as Journalism 101 in U.S. universities — Give out the facts , nothing but the facts in news reports and save your opinions for op/ed and feature articles . But alas, journalists in the West are often the worst sinners when it comes to lack of adherence to this fundamental principle of journalism, especially in dealing with Africa. The ITV Anchorman who interviewed President Ernest Koroma had preconceived notions already about the President , which he wasted no time to project — the same bigoted , fallacious and negative notions that give them the panache to describe every African leader as a dictator and every African nation as a failed state , while reserving flattering adjectives for despotic Western Presidents . His attitude was scornful and condescending and he could not disguise it in his description of the President , his media aides and his work space. It was a deliberate attempt to project an unflattering image of President Koroma to readers to prejudice their minds before they read the interview. The journalist started by insulting President Koroma whom he described as having a cluttered office. Was that what the interview was about ? To insult our President ? Where on earth do you not find a cluttered office once in a while, if the occupant of that office has a heavy work load that deals with movement of files and office stuff ? Those who have offices know that it is an inconvenient problem they cannot escape. Peak times do come when we all have cluttered offices. I would not want anybody to enter my office when the UN General Assembly is on or during the running UN Security Council Reform meetings. My office would be cluttered with files all over the place, even on chairs . I cannot help it because I need them like that to enable me to speed through my work efficiently. How much more a President of a country facing such a monumental and monstrous crisis like the Ebola outbreak to add to his multitudinous tasks ? He must have had many important files opened on different tables, which the writer interpreted as a cluttered office. Or the office may not have been cluttered at all. 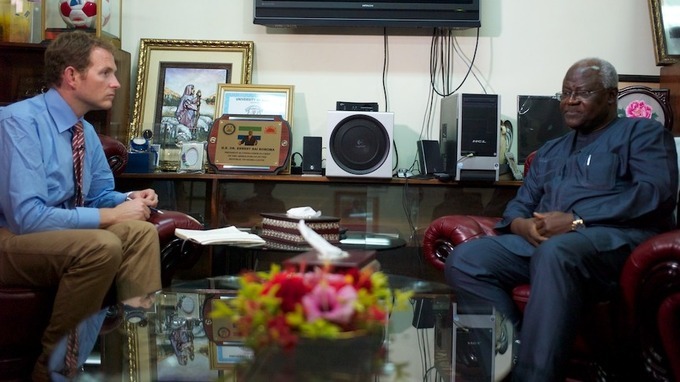 President Koroma is a workaholic, so it should not be surprising if indeed it was true that he had a cluttered office . Everybody knows that , at this critical time , the President is overwhelmed with state and international matters and the Ebola crisis at a time like this . A sensitive and understanding journalist would have understood that and not made it a feature of his interview . It is the hallmark of a workaholic to have a cluttered office once on a while . It was not a big deal. But even if President’s alleged cluttered office was a big deal , the journalist should have skipped mention of it for ethical reasons. That was gross intrusion in the privacy of the President and a betrayal of trus. He was there to interview the President . He was not there to observe his office and describe it to the world. That was insolent behavior at its highest. He should have paid more attention to the job he went to do . Whether or not the office was cluttered had nothing to do with the interview and a professional journalists practicing top end ethical journalism would have ignored mentioning it. But the aim of this journalist was to create an unnecessary linkage between the President’s office environment and what he had to say about his commitment towards containing the Ebola outbreak in his country to bias his readers’ and viewers’ minds from the word go . I want to submit that the journalist deliberately injected that aspect in the interview to stereotype another African President . After all, African Presidents are their quarry. In fact, they are not presidents. They are dictators. It was one more moment to ridicule another African President . Unless he is a blind man, the journalist must have known President Koroma from his countless photos in the media . Nobody would believe that this journalist had never had even the faintest photo of the facial features of President Koroma , before he went to State House to interview him. Yet, , watch how he describes President Koroma. “Behind a desk at the far side, was an elderly gentleman making notes. I did a double take and felt confused. Was that the president already sitting there? So much for our 20 minutes! “ SATIRE at its highest. Unwarranted satire that had nothing to do with the interview. I found that description of my President–A hardworking , focused, devoted President I love and respect– most insulting. But that was not all. How true was this statement about our President : “This is a rare public appearance by the president who has shunned the limelight since his country has been plunged into the chaos of the world’s worst Ebola epidemic.” This journalist definitely was not talking about President Koroma, the same President Koroma, who has been all over the place receiving international and local stakeholders and contributors to the Ebola fund ( faithfully reported everyday by the President’s State House Media team led by the efficient Jarrah Kawusu-Konte , with pictures ). This TV Anchorman was certainly not talking about the President Koroma who has been all over the place visiting Ebola treatment centres and the Burial Command Centre ? Was this not the same President who risked his life flying in a helicopter to far away Kailahun, the then epicentre of the Ebola outbreak and Kenema ? Was this not the same President whose life was saved by God when he went to Lungi International Airport to board a plane for England to attend an international Ebola Conference on Sierra Leone, a plane that developed engine trouble that was fortunately discovered only as it taxied on the runway ? 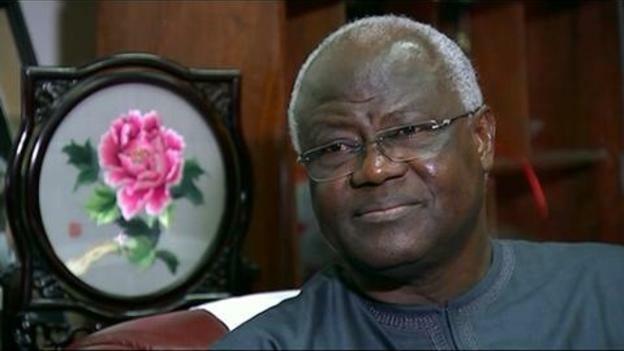 President Koroma has also addressed the nation a couple of times within the past two months ! ! ! So, where did this journalist get the information that President Koroma ” has shunned the limelight since his country has been plunged into the chaos of the world’s worst Ebola epidemic” ? What do you call such a blatant misrepresentation of facts ? Thirdly, who is he to interpret the meaning of the President’s responses , as if President Koroma did not know what he was saying or was engaged in doublespeak ? It was another insolent attempt to ridicule a hardworking President , whose heart is unhappy because of the crisis facing his country . Is this what these journalists are trained to do, to make fun of people saddened by unintended circumstances ? The ITV deserves to apologize to President Koroma for the unprofessional, unethical and insensitive treatment of the sovereign President of a whole sovereign nation at a time when his heart is bleeding because of the health emergency in his country. He should have been sympathetic and spared President Koroma his impudent and contemptuous behavior. I hope some of these journalists receive sensitivity training. Again, who is this man to inject his views in the President’s responses ? When a journalist interviews a personality , especially a President of a country, he gives him the respect his views deserve . He was there to interview President Koroma and should have let the facts speak for themselves and the public determine the validity of the president’s projections, for instance. It was President Koroma’s moment, not the journalist’s . Yet he used every occasion to steal the moment from the President. The journalists writes : “He thinks by the end of the year the virus will be contained and that the ‘ worst will soon be over’. I’m not so sure.” Really ? Then what was the purpose for asking the President if his mind was made up already that Ebola would be an ongoing problem , without end ? This was not an interview at all, but just another vain attempt by a Western journalist to continue to perpetuate Western stereotypical nonsense against our African Presidents. We’d been promised we’d have at least 20 minutes to set up our equipment for an interview with the president of Sierra Leone Dr. Ernest Bai Koroma. After waiting in a meeting room we were ushered to his cluttered office to prepare for the encounter. It was crowded with advisers and press secretaries. Behind a desk at the far side, was an elderly gentleman making notes. I did a double take and felt confused. Was that the president already sitting there? So much for our 20 minutes! My cameraman hurriedly set up lights and the camera, as the audience of presidential staff watched on and the president silently continued his work. He finally came over to say hello and the interview got underway. This is a rare public appearance by the president who has shunned the limelight since his country has been plunged into the chaos of the world’s worst Ebola epidemic. I believe we have reacted appropriately. His critics say he took five weeks to say anything publicly about Ebola, and it took 15 weeks to declare a national emergency. Translation: the world has taken a long time to wake up to this, but they are finally sending the people and equipment we need. He thinks by the end of the year the virus will be contained and that the “worst will soon be over”. I’m not so sure. We visited the main hospital in Freetown where new patients arriving with a fever are forced to wait in a tent outside the main gate, because the isolation ward inside is so overwhelmed. The most dire predictions for the spread of the virus are really scary. 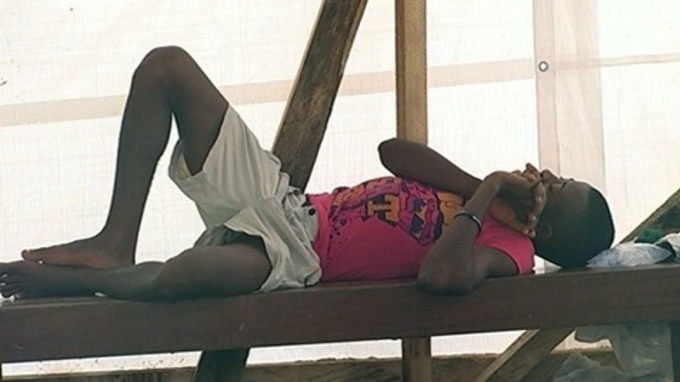 If the hospital here is unable to cope now, turning away patients who clearly are sick and could be infectious, what an earth will be the situation in a month’s time when the number of infected may have doubled from three to six thousand in Sierra Leone? There has been some criticism of the international community’s response, that it’s been too little too late. Do you feel that the people of Sierra Leone have been let down? Well my focus now is moving forward. I don’t want to get back into what has happened, I think we have now mustered enough international support. The UN is here, they have established a mission, the UK government has come in a big way to provide support to the government and the people. The Americans are here, the Chinese, the Germans, the African Union. A lot of support has now been mustered to fight Ebola. I think the world has come to the realisation that Ebola is not an issue of just one country or just one region, it is a global issue. We believe with this international solidarity that is now on board, we should focus on coordinating the efforts and ensuring we get Ebola behind us as soon as possible. Some of your media here have been critical of your leadership during this crisis- it took you five weeks to speak after the outbreak, 10 weeks to visit the epicentre, 15 weeks to declare an emergency. Do you accept that your personal reaction was slow? The Ebola outbreak was announced in May and it was new to all of us. It has no clearly defined path on how you should address it. The reaction when we had the outbreak was also very mixed from our people and we were not alone in the fight. We also had WHO, who had principally advised us on what do and at every step of the way we have had consultations with them and I believe that we have been reacting appropriately. So you don’t feel that in hindsight you would have done things differently? I believe that the government came in very big in the initial reactions. We depended entirely on government resources, government personnel to execute the fight and if the government had not reacted in the way and manner it did when we had the outbreak, maybe it could have been worse than what we are experiencing. But you must realise that all of what was done initially and until most recently we were purely government efforts. Even support provided by the international partners was purely advisory and I believe that the government has been very focused, the government was determined but we were clearly outstretched. We are coming from a situation wherein we had to start building up our medical infrastructure. We had limited personnel out there- it is not something that was caused by our government, we inherited it but we are determined to effect changes and the changes are already being appreciated out there because the mortality rates we are changing. The people visiting treatment or medical centres was on the increase and we initiated a free healthcare scheme that was registering a lot of success. We know there are still challenges but all of it was going on and we were rated as number two in terms of economy growth in the whole world and we have maintained that position for two years running- we were busy doing that when Ebola struck. That economic growth is clearly going to come to a standstill now. Are you worried about the economy of this country? Of course. Everybody will be worried. We are positioning ourselves to effect in a transformation in the country. We believe that the first five years of the transformation was what we were going through when we had this difficulty. There has been lots of reverses. The economy is slowing down now, inflation is increasing and the revenues of government dwindling down. Everything is affected and everybody is directly or indirectly affected by this. This was not what we expected at the start of the year but this is where we find ourselves now and we must just move forward. There has been talk, perhaps alarmist, about this threatening the very existence of some of these countries, Sierra Leone included. If Ebola isn’t tackled it will lead to a complete breakdown of the situation here. Is that something you’re concerned about? Well, we are happy that there has been a lot of international response. There has been commitment in terms of filling in the gaps we wanted and there is a lot of work going on now – we wish this had been done some time in the past, but that is where we are. We are working on improving on the bed capacity of the country, the laboratory capacity, the holding centres, we are marshalling a lot of resources to train our medical officers and there is a lot coming from outside; the British are now training medical teams at various centres, the Chinese have come in with their medical teams and I believe that the worst will soon be over. I am of the view that by the end of the year we will be in a position of not eliminating, but containing the Ebola virus. How many people by then, do you think, will have died? I cannot make any projections on the numbers. Our focus is to cut down the increase in the numbers that we are now having and the Ebola is such that the impact within 21 days can be substantial and that is why we believe with all of the efforts that we are making, we will get there. What’s your message to the international community – you still need more help, don’t you? A lot has been done but we still have gaps. We still need more doctors, nurses, hygienists, nutritionists, lab technicians, social anthropologists that will come in and help people in the contact tracing and social mobilisation and logistical support also required – so there is still a lot to do but, with the response is now being galvanised, is encouraging but it will not be enough. We have to work together until we bring this whole fight against Ebola behind us. There is a lot of hysteria in the West, particularly about Ebola. Would you like to take the opportunity to correct that hysteria? I think I have clearly indicated that Ebola is now a global issue but Ebola can also be addressed. We have had over 700 Sierra Leoneans that have survived, treated in our centres. We have put in place protocols in our airports and seaports to ensure that we don’t export Ebola. We believe that by collaborative efforts we will be able to isolate Ebola and get is behind us. The focus should be on all if us working together to isolate Ebola. There is no point isolating any country that has the infection. We believe there are established protocols that we have adhered to. If there is anything more we should do in terms of enhancing the procedures in the airport screening, we are quite prepared to do so, but I think isolating Sierra Leone is not helping. Ebola in Sierra Leone is Ebola everywhere. Ebola in Liberia is everywhere and isolation is not helping and having any fear about people going to the country or coming from the country will not help. This is a global issue and it must bee addressed globally. Are you confident those resources are in the pipeline? Well, a lot of promises have been made but there is a lot of work in progress – you see it in terms of visibility of foreign personnel that are coming in. The troops are in. The UK government has sent in soldiers and medicals to come build our centres. The Chinese have also come in with their medical [supplies], they have built a laboratory and trying to provide logistical support. So there is a lot of work in progress, which is encouraging but there is still a lot to do. So I think whilst we appreciate what has been done we believe that with more support we will get Ebola behind us pretty soon.